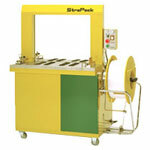 The Strapack RQ-8LS is considered the "Gold Standard" of the strapping industry. If your application requires a low conveyor and bottom seals, the RQ-8LS is the perfect choice. This strapping machine has a rapid cycle time of 40 straps/min with no lubrication required, which makes the maintenance cost for this plastic strapping machine very minimal. This particular size of the RQ-8LS machine includes Arch Reinforcement. 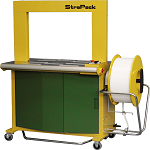 The Strapack RQ-8LS strapping machine is innovatively designed for easy operator use and easy strap loading. 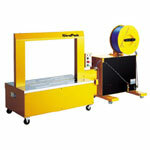 This Strapack machine carries a standard power supply of 110V Single Phase with an optional Three Phase. The RQ-8LS is highly versatile because it allows the operator to easily adjust strap tension on 1/4, 3/8, and 1/2 inch straps in order to accommodate many different products. This RQ-8LS model is specially designed with an adjustable height for different sizes to accommodate heavy or bulk goods such as televisions, computer equipment, and furniture. Strapack is renowned for their commitment to excellence and high quality products. The high quality Strapack RQ-8LS comes with a 6 month warranty and guarantees great results. Boatman Marking has the right Strapack strapping machine to fit your individual packaging needs.